Most every day I get up around 4:30, go downstairs, brew a pot of coffee, and begin to percolate. The percolations always sound about the same. With one difference. Coffee doesn’t stew. I do. Looking in from the outside, you might say “You can take a man out of the pulpit, but you can’t take the pulpit out of the man,” and you would be partly right. But I have no desire to stand in a pulpit. I loved the early mornings when a sermon began to percolate — pausing over a biblical text while world events swirled around my head. I still do. You can’t take that part of the pulpit out of the man. The world is always swirling, but these days the swirling feels different. More like a tornado. I go to bed with the news storming in my head and I get up early with it still swirling. But, no matter how ominous the news is, I know I can always take time out to get a better grip, to settle the spinning, to go into the eye of the storm I have become. Some mornings, it’s a word that pops up to hold my attention. Yesterday it was two words: serpents and doves. This morning there are three: serpents, doves, and a fox. Stay with me. Views from the Edge is my pulpit in retirement; it’s my pulpit, and I’ll cry if I want to! But this morning the words don’t lead me to cry. They inspire hope and define the way forward. It began yesterday with serpents and doves. “Behold, I am sending you out as sheep in the midst of wolves, so be wise as serpents and innocent as doves,” says Jesus to his disciples. Then this morning, along came the fox. “Go and tell that fox. . . ,” says Jesus to those who have come to warn him. “GO AND TELL THAT FOX”? It’s not quite what it seems. The word is hard to render in English. In the culture of the times, it was a derogatory term, a slap in the face, according to biblical linguist Randall Both. Sort of like ‘pipsqueak’. Or small-fry, usurper, poser, clown, insignificant person, cream puff, nobody, weasel, jackass, tin soldier, peon, hick, pompous pretender, jerk, upstart. The ‘fox’ is Herod Antipas, the despised tetrarch, a Jewish national who feathered his own nest, a turncoat who served at the pleasure of the Roman Emperor Tiberias. He had ingratiated himself to Tiberias by changing the name of the Sea of Galilee to the Lake of Tiberias and by building a new city with a lush vacation palace on the site of a Jewish cemetery. Herod was a turncoat to his faith and his country. Herod was a usurper. The ‘demons’ in the New Testament are not creepy little creatures, although they are creepy. They are twisters of goodness and truth, liars and tricksters who take possession of a person or a society. Sometimes they hold power and authority, building palatial palaces and private clubs, ingratiating themselves to a foreign power by changing the name and language of a local treasure. The demons make us sick. Healing comes as a result of throwing out the demons to end the demonic occupation. Driving out demons and healing is the continuing work of the community gathered around Jesus. “Let those with ears hear.” Хорошего дня. –Gordon C. Stewart, Chaska, MN, November 30, 2018. Those who grew up on the Howdy Doody Show will recognize that Mr. Bluster is at it again tonight in DesMoines, Iowa. The only things missing are Buffalo Bob and FOX. I rarely use the word. But a conversation today makes me say it. Some things are just plain evil. 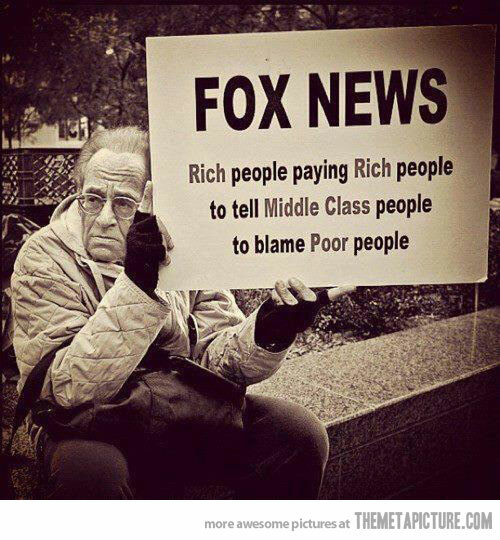 “FOX is not news. It’s right-wing propaganda.They’re the 10 Commandment station. Yesterday’s vote in the U.S. Senate comes down to this: cowardice in the face of gun-lobby bullying. A well-funded misinformation campaign by the NRA, gun-manufacturer’s lobby, and FOX alleging – although the bill itself explicitly prohibits it – that the moderate compromise proposal would mean a “national registry” of gun owners and erosion of the Second Amendment. The fact that the bill’s co-sponsors had “A” ratings by the NRA made no difference. What makes a difference is money and profits. And the difference they make is fear. Why were the Senators cowards? They put their campaign financing ahead of moral principle. According to President Obama, speaking to the American people yesterday, NOT ONE of the Senators could give him or Vice President Biden a reason for opposing the legislation…other than “politics“. Not one. 90% of Democrats voted in favor. 90% of Republicans voted against it. Polls show that 90% of the American people SUPPORT universal background checks and limiting the size of magazines. Democrat Senators Max Baucus (D-Mont. ), Mark Begich (D-Alaska), Heidi Heitkamp (D-N.D.), and Mark Pryor (D-Ark.) broke ranks with their Party by voting against. Republican Senators Susan Collins (R-Maine), Mark Kirk (R-Ill.), John McCain (R-Ariz.), and Pat Toomey (R-Pa.) broke ranks with their Party to vote in favor. BREAKING NEWS: Last night former Republican Presidential Candidate Senator John McCain, joined by Senators Collins, Kirk, and Toomey, invited the other caucus members of the Grand Old Party (GOP) – “the party of Abraham Lincoln” – to join them for an evening at Ford’s Theater for a private showing of the film “Lincoln” and discussion of how he and the children and teachers of Sandy Hook Elementary School died.